The Crystal Clear Flame Appreciation Award is an impressive crystal award to receive. 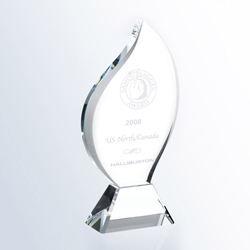 This solid crystal flame award is available in three different sizes. Included in the cost is crystal engraving your message, slogan, or company and a high-end presentation box.